You can make an online pledge on our secure website anytime by going here. During the show we will be offering a Grigoris Bithikotsis CD as well as the other gifts shown on the website if you pledge at a certain level. Details will be announced during the show. 609 258 1033 during the show this Sunday from 1:00 - 3:00 PM EST. We accept pledges for any amount. Thanks! I am a bit late posting about last week's show. 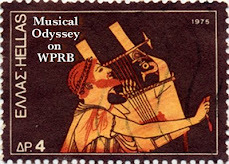 I featured the music of Yiannis Voyatzis (or Vogiatzis). There are not many photos of him available, just the small CD cover shown here. I am looking forward to the membership drive which I posted about last week. All of the details of the drive can be found in this press release (PDF format) here. Or you can see the details on the WPRB blog here. And this year, we are giving away a car! Also, there will be one or two specialty gifts available for purchase during the show, more details will be posted soon. 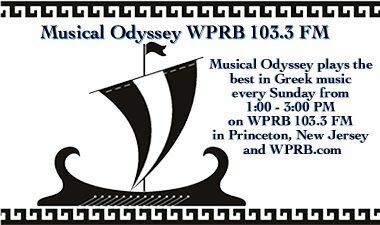 Starting on Wednesday, October 1st at 7:00 pm ET, 103.3 fm WPRB will be holding its second-ever membership drive. The drive will run until the end of the Wednesday, October 8th broadcast day. WPRB operators will be standing by at 609-258-1033 to take pledges during all hours of the broadcasting day. Listeners can pledge with all major credit cards or with PayPal using pledge.wprb.com. Show your support for WPRB’s unique and varied programming. Special premium gifts given by over 25 record labels, distribution companies, and artists are available to listeners who pledge with a credit card at specified hours which are to be announced over the air only. Specialty gifts range in value from $5 to $200 in retail value. In addition to the special drive programming, WPRB will be giving away a brand new, custom-designed 2008 Toyota Yaris to one lucky listener this October, courtesy of FreeYrRadio.com. The FreeYrRadio campaign, which supports independent radio stations across the country, selected WPRB as a participating station this year, and hosted a special free benefit concert this past summer, featuring Secret Machines and DJ Dave P.
Today I will be featuring the music of Arkadia (pictured here). The group mentions the show on their website here and on their facebook page. The photo is courtesy of Arkadia. Please note that the show broadcasts on Sunday from 1 - 3 PM. The selections from Arkadia will probably air at about 2 PM (which is why they mention 2 PM). 1960 film "Rantevou sthn Kerkyra" ("Rendez-vous at Corfu") singing Kapou Yparxei I Agapi Mou ("My love must be somewhere out there"). 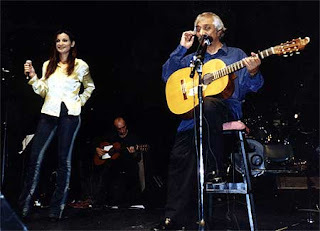 Today I featured the music of Kostas Hatzis. There are not a lot of photos of him available, but here is a photo of him with Evie Kapatai. Below is a vintage video of him singing An o'arnitho and another video of him performing Epistrateo. The playlist for the show hosted by Giorgos last week is here. I will be hosting this Sunday, the featured artist will probably be Kostas Hatzis.